During our field trip last weekend, we stopped briefly at a mineral show in the Sierra foothills. I wasn't going to buy anything, but then I saw some specimens that made my jaw drop, and they were available for an incredibly low price. I couldn't resist adding these beautiful pieces to my teaching collection at the college. 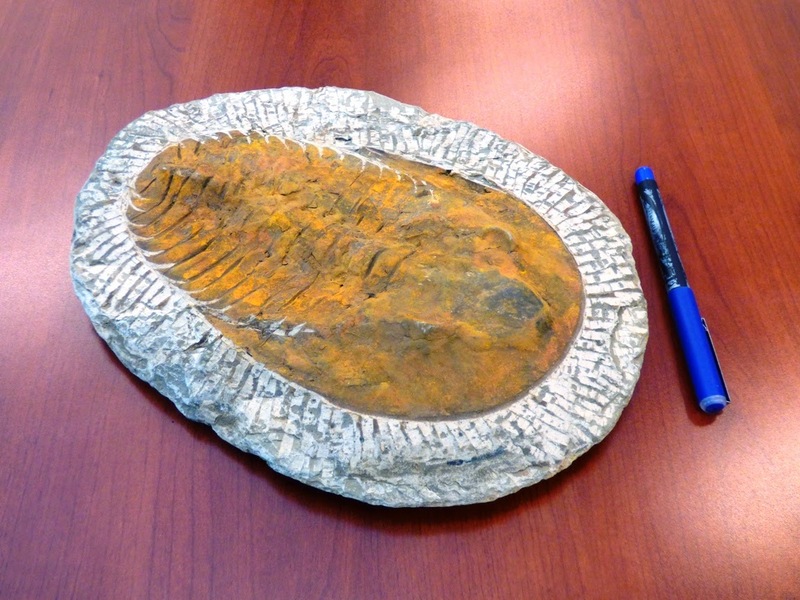 The first was a giant trilobite fossil from Morocco. Trilobites were ancient arthropods, among the first of the complex lifeforms to inhabit the Paleozoic seas. They had brains, eyes, legs, and survived in numerous different habitats. But most trilobites are very small, maybe an inch or two long. This monster was huge! And the seller was willing to part with it for only $30! I snapped it up. I was headed back to vehicles when I saw the second incredible specimen. It was the tooth of a Mosasaur, one of the most terrifying predators in the Mesozoic seas. It was even in matrix, along with a fragment of the jawbone. And for just $12, how could I pass it up? Another specimen purchased. 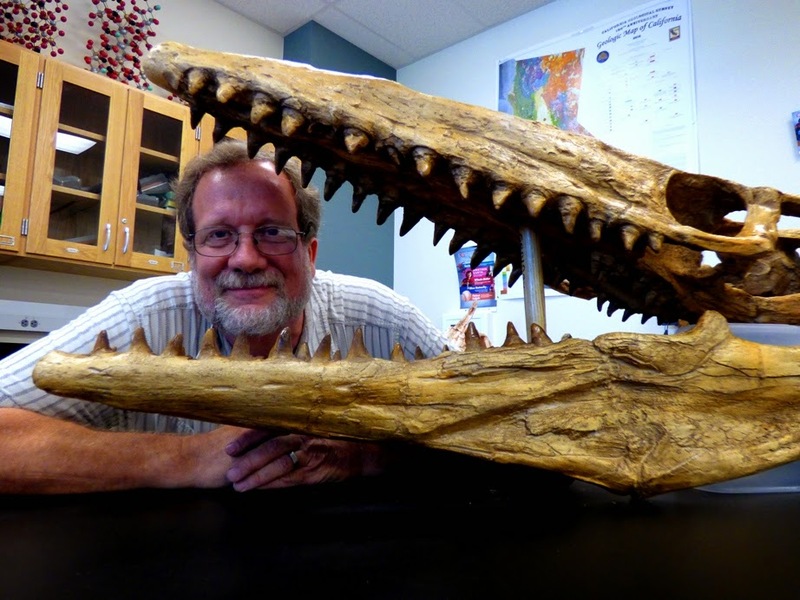 Why the excitement over a Mosasaur? It's because they were one of the most interesting creatures ever found in our region. 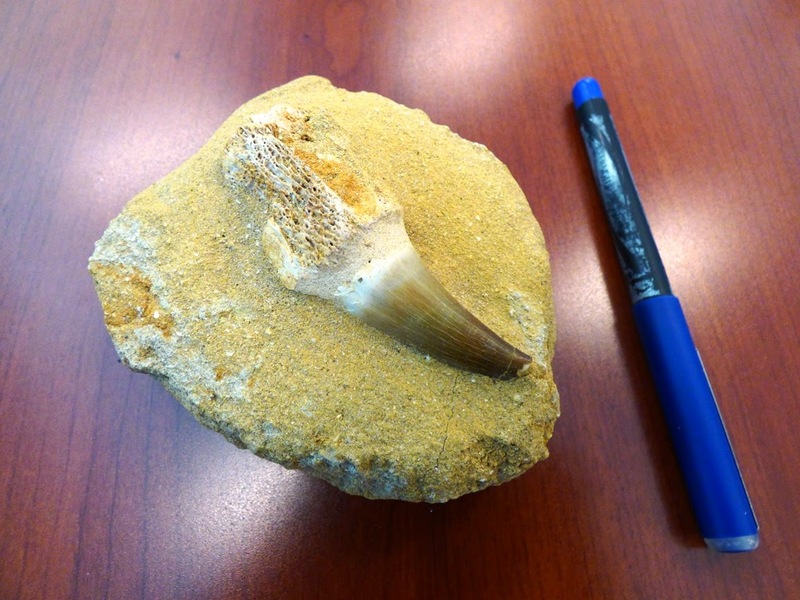 A local boy found the fossil in the foothills of the Coast Ranges just twenty miles or so from our campus. We've already acquired a skull of the 30-foot long creature for demonstrating our local paleontology finds. I know some of you are already squirming just a little bit wanting to tell me that I was duped, and the fossils I purchased are fakes. Actually I already knew that. There's an old adage that if it's too good to be true, than it probably is. Producing fake specimens is an art that began just minutes after fossil collecting became "a thing" several hundred years ago. The trilobites and ammonites coming out of Morocco are particularly egregious examples. Genuine specimens have come from the region, but they are relatively rare and very expensive. Plenty of nearly worthless fragments exist, and people soon found they could mount partial and broken specimens in a matrix and sell them for a decent price. I imagine quite a few people have managed to eke out a living doing so. If dealers were honest about such things, it wouldn't bother me too much. I wanted a large trilobite replica that I could use while discussing paleontology, and this specimen fit the bill pretty well. The ironic thing is that the dealer clearly marked some of his specimens of smaller trilobites as "copies", but he basically told me "why buy these smaller fakes when you could have the real thing right here for only $30?" As a replica, the price was pretty cheap. A genuine sample of this size could probably run into four figures, and sometimes these fakes carry such price tags. That's a pretty handy profit margin, courtesy of some poor uninformed person with too much money on hand. The tooth is most likely the real thing, but was probably damaged on the back side. The root is probably left over from the faker's lunch, a piece of cow or sheep bone glued to the tooth. Sometimes they make entire jaw bones out of this stuff. 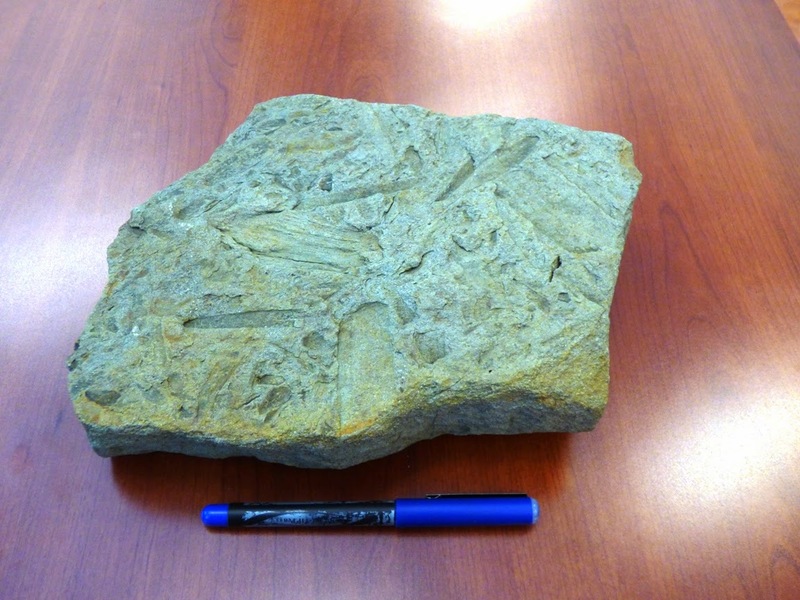 If you want to see our latest genuine fossil acquisition, here it is: plant fragments in a slab of sandstone. It's remarkable because it comes from the Western Metamorphic Belt of the Sierra Nevada, and metamorphic rocks don't often preserve fossils, but it happened here. It dates from the Jurassic period, a time when dinosaurs wandered the nearby landmass. Leaves and fragments of wood flowed into the nearby shoreline and came to be preserved in the sandy layers. How do I know it is genuine? Well, I found it myself. That's the best way to confirm such things, and it's fun to boot. This is a very good blog! I love all of the photos of the fossils. That trilobite fossil was amazing. I found that the Mosasaur fossil was very amazing as well.